Samsung recently unveiled a new interchangeable lens camera system which they claim is the slimmest and lightest in the world at 22.5mm and 158g, respectively. The NX Mini features a 20.5-megapixel BSI CMOS sensor, a built-in flash and a 3-inch flip-up touch-enabled LCD screen that can flip 180 degrees for selfies. As we’ve seen on other Samsung cameras, the NX Mini has built-in Wi-Fi and NFC support to facilitate sharing to cloud-based services like Dropbox and Flickr, both of which come pre-loaded. Additionally, the camera is packed with a number of consumer-friendly filters and effects on top of various trick shooting modes. On the video side, the NX Mini is capable of recording 1080p clips at up to 30fps although your recording time will be based on the capacity of your microSD card. The NX Mini will arrive in a couple of different kit options at various price points. One includes a 9mm f/3.5 (24mm-equivalent) lens priced at $449 while the other is paired with a 9-27mm f3.5-5.6 (24-73mm-equivalent) zoom lens and an external flash for $549. Neither lens is particularly fast although a third 17mm f1.8 (46mm equivalent) is set to arrive in July. As a consumer-grade camera, however, one has to question the choice of having more prime lenses than zoom lenses, but I digress. 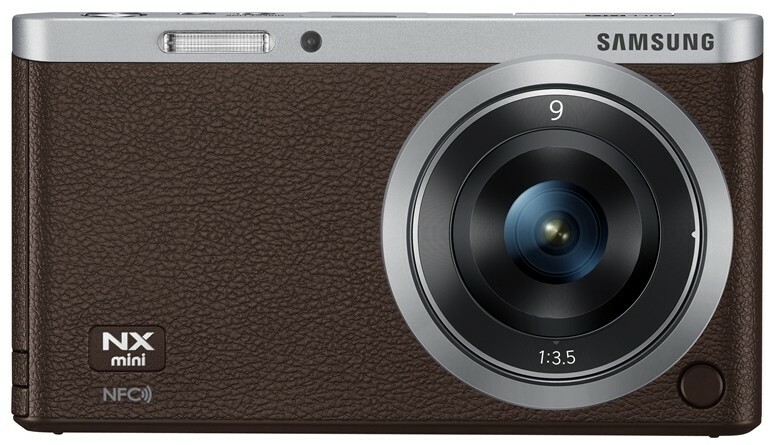 It’s also worth pointing out that the camera uses a new lens mount system, known as NX-M. Traditional NX-mount lenses will work with the camera but you’ll need a $149 adapter to make it happen. Expect the NX Mini to arrive in the US and other markets sometime next month in white, black, brown, light green and pink color schemes.